The fragrant winter and early spring color of desert cassia is a wonderful feature of this incredibly tough evergreen shrub. Sprays of showy, rounded yellow flowers bloom in clusters at the tips branches. 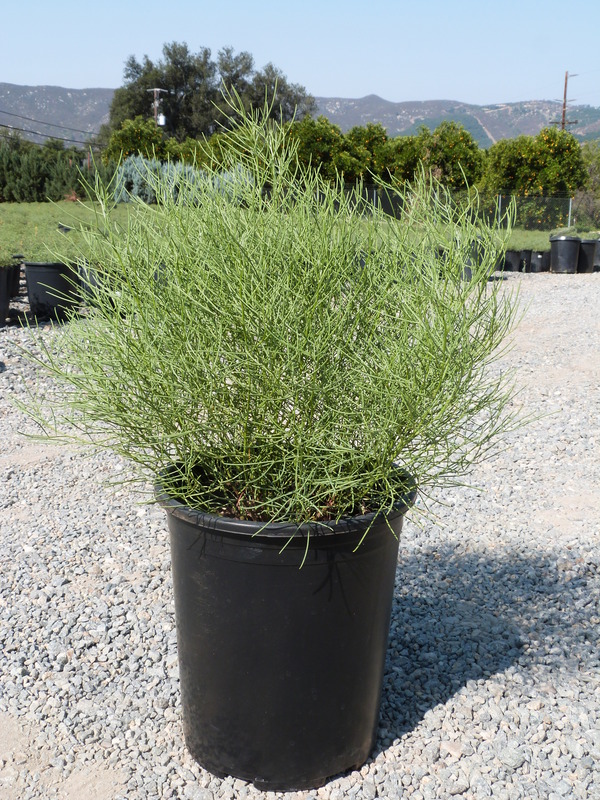 Its dense, mounding form has needle-like, silvery-green leaves, making it an excellent feature in drought tolerant gardens even when not in bloom. Plants are fast growing, so they are a good choice for filling in low-maintenance areas. Because it can tolerate reflected heat, desert cassia works well in areas with an abundance of concrete. Keep in mind though that once flowering is finished, they leave behind seed pods that do create some litter. Desert cassia is tough! It can survive in both desert or coastal conditions, and will even tolerate clay soils if not over watered in summer. Plant in full sun so plants can thrive. Though desert cassia is very drought tolerant, it will benefit from once a week watering in the hottest months to keep it looking its best. In late winter, selectively prune any out-of-bounds branches to keep desired size and shape. Plants do not respond well to shearing. Winter blooms, drought tolerance and easy maintenance make desert cassia a great fit for a variety of landscape designs.